Other name for this fish is oriole angelfish. It comes from the Indo-west-Pacific ocean region. Care Level: The bicolor angelfish is a medium level fish to maintain. On a scale of 1 –10, the (10 being easy) it would rate a “6”. 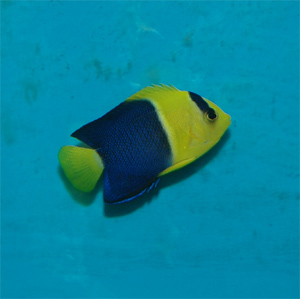 Temperament: The bicolor angel is not overly aggressive and can be kept with other fish as well as members of its own species (if given enough room). 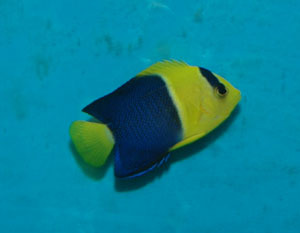 Reef Compatible: No – the bicolor angelfish will often bite at or eat corals and clams. This is a fish best kept in a fish only tank. Diet: Omnivore - will take a varied diet of chopped shrimp, brine shrimp, chopped squid and clams as well as flake food and plant matter such as spirulina algae. They should be fed 2-3 times each day. Habitat: Provide with plenty of hiding places and live rock growth for grazing on – keeping live rock is important.